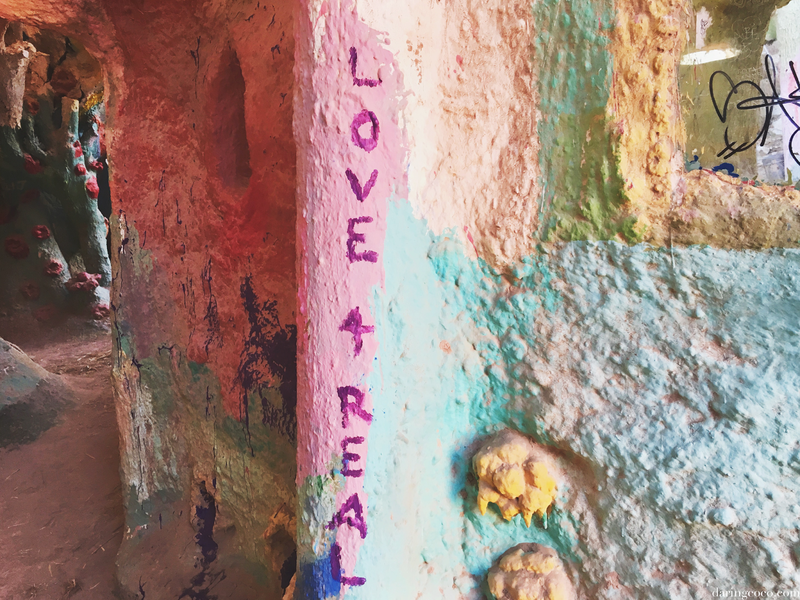 Visiting Salvation Mountain was a most profound experience. Not merely from a creative or artistic viewpoint but also spiritually. 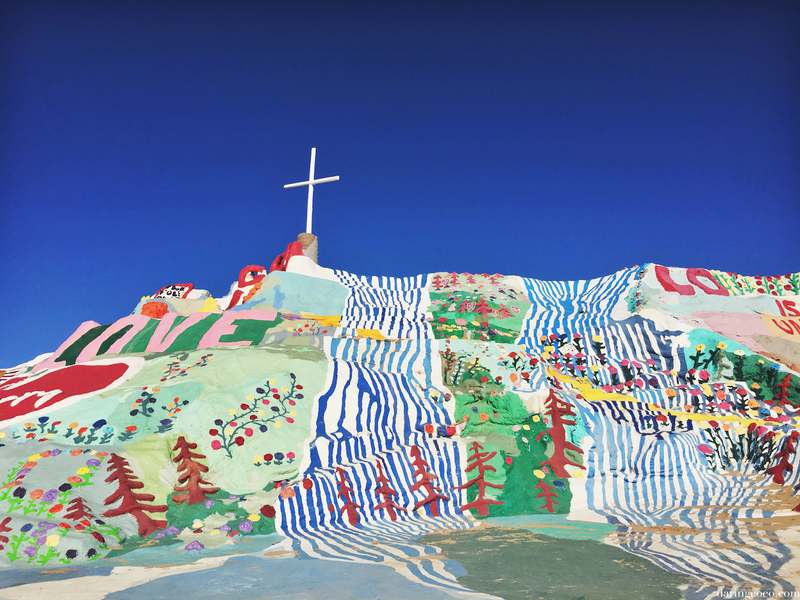 Salvation Mountain is a point of interest situated in the midst of desert sands and nothingness. Quite literally a mound of intensive hues and stirringly heartening words. Words in praise to a higher being; adoration for God with an enduring message of love. I’ve never been someone you’d consider religious by any means; especially as a child. For me growing up I always felt rather uncomfortable and repelled being inside a church. And while I still feel slightly awkward inside, even when visiting historic wonders, the past few years have seen me adopt a path of spirituality and embracing the Universe and God. 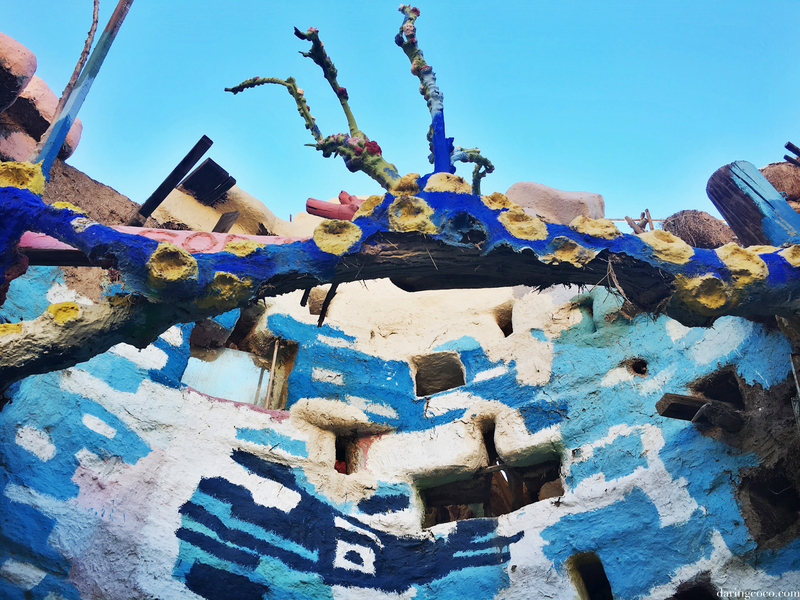 So to venture out to Salvation Mountain was also internally moving. 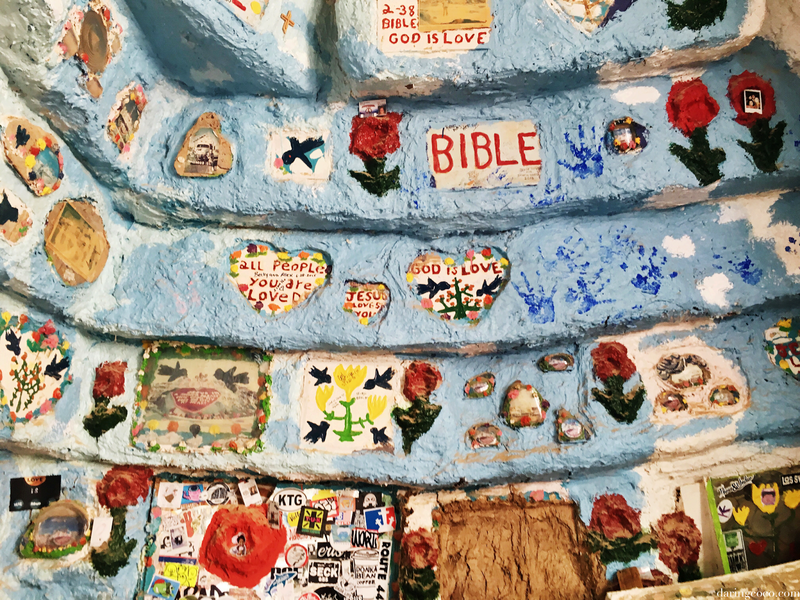 At Salvation Mountain there is no denying that acute sense of positive energy buzzing through every square inch. From the site itself to the rays of sunshine illuminating the grandiose spectrum of colour. Even the gentle breeze that tickles and nuzzles your exposed limbs have a calming affect. Regardless if religion or spirituality is or is not your thing, purely witnessing such a feat of artistic creation and devotion is bound to impress. Because the sheer adoration and love of one singular human being is magnificently evident in this labour of love. 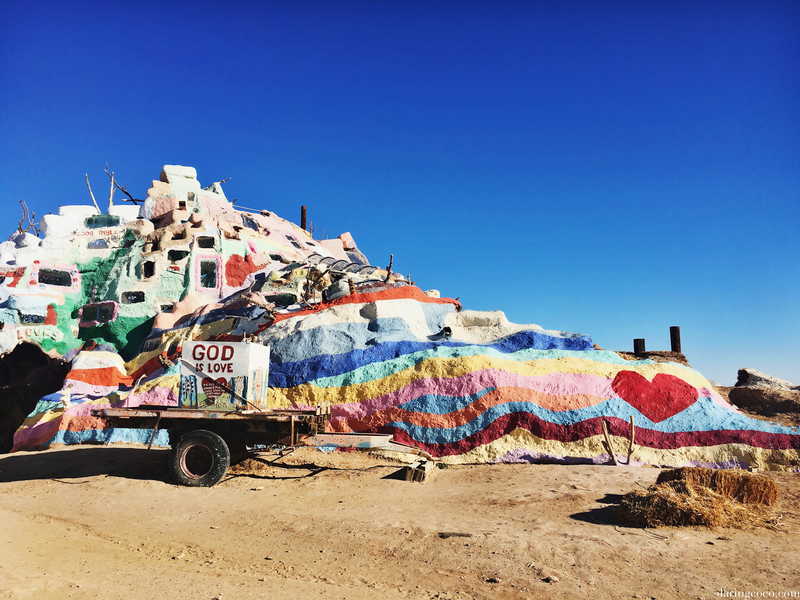 The journey to Salvation Mountain commenced on incredibly high spirits. To the untrained eye it is one of insipidness. One of aridity and the occasional dotting of palm trees. I was in a state of eager anticipation the entire way, impatiently desperate to see the telltale signs of a grand peak of opalescence in the horizon. But alas nothing but dusty browns and a contrasting cerulean skies for miles. At times I wondered if perhaps my unreliable navigation system was leading us astray, as it had on many prior adventures. But the cacophony of vehicles ahead and behind ours lead me to believe that we were indeed travelling in the right direction. Excitement spikes suddenly as you traverse from a traditional road onto one of dirt. The journey shifts from velveteen to something resembling more of a jaunt at a theme park. The choppy and uneven road continues for some time until finally there it is, slowly developing from beyond the horizon. 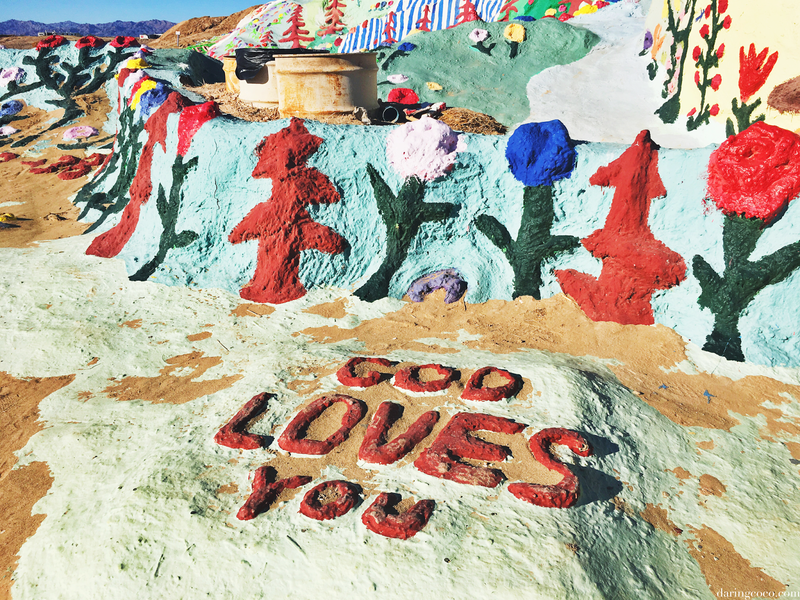 Salvation Mountain. A maze of exhilarating vibrancy springing forth, assuring and promising sanctuary to those who seek it. And as if the Universe had read my mind, a shirtless young male male with cascading dreadlocks appears on the side of the road, head arched to heavens, deep in thought, arms extended far beyond as if to clutch an invisible energy. Fingers closed save for the index and middle ones, the recognised sign for peace being shared to all who passed him by. An unintentional greeting, but a most welcome embrace and a promise of things to come. 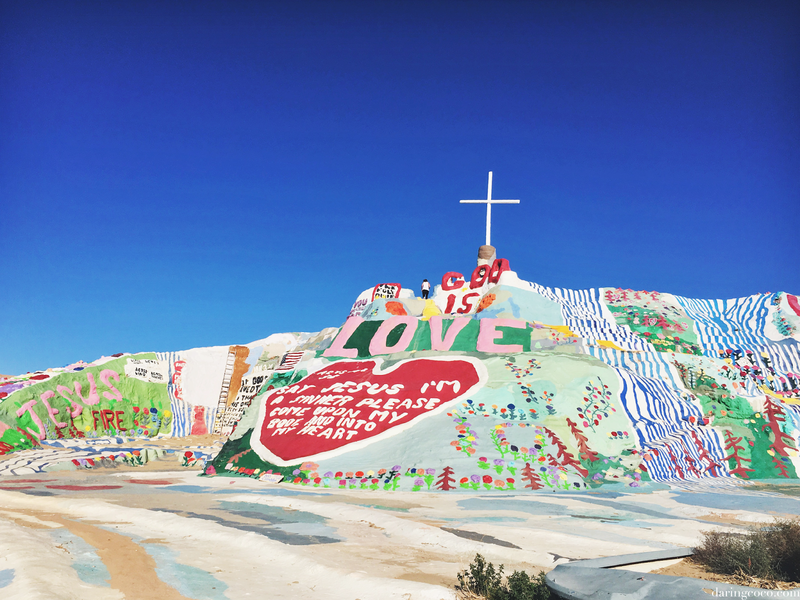 Driving into the grounds of Salvation Mountain really makes you pause. The magnificence and volume of such a place is truly breathtaking. And all this is one mans work; one mans tribute to God. His affection and passion to promote peace and love. A project that began back in the 1980’s by the late Leonard Knight, painstakingly cared for to this day. 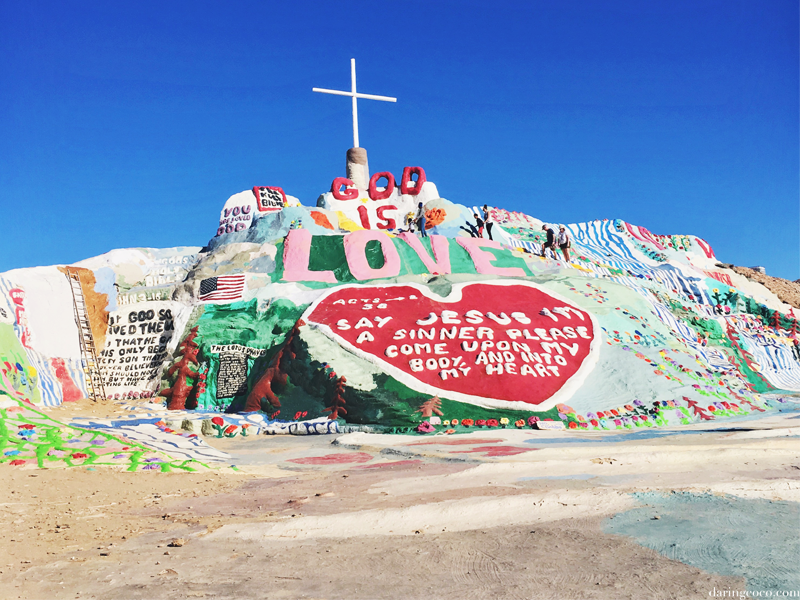 The mountain itself is created with clay and adorned with numerous messages of love and praise. 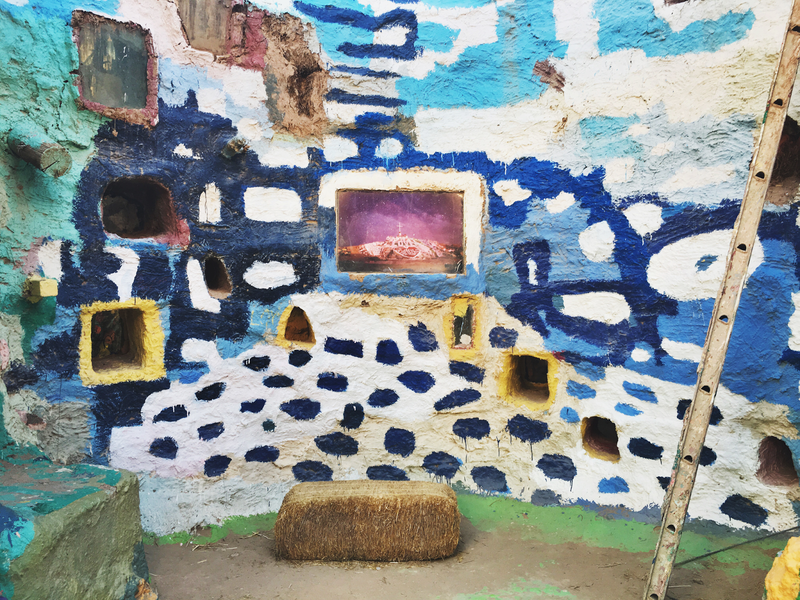 You’ll also find it embellished with a number of paintings and sculptures like florals and waterfalls. Around the mountain various vehicles and trailers are dotted throughout, all enhanced with Leonards signature artwork and messages of hope. You are at liberty to wander and peruse the grounds, just make sure you stick to the yellow pathways and not off them. It was a little disappointing and saddening watching fellow tourists traipsing about freely, despite numerous signs directing and pleading for you to remain on the designated coloured path. At times it actually made me mad, how nonchalant and careless people were being. Treading on on areas with obvious signs of heavy paint erosion. The signs are there for a reason, to protect the mountain itself. Aside from the mountain there are various chambers and tombs to further explore. There are three large catacomb like caverns to one side. Each with a different theme and all heavily decorated with words and clippings from visitors over the years. 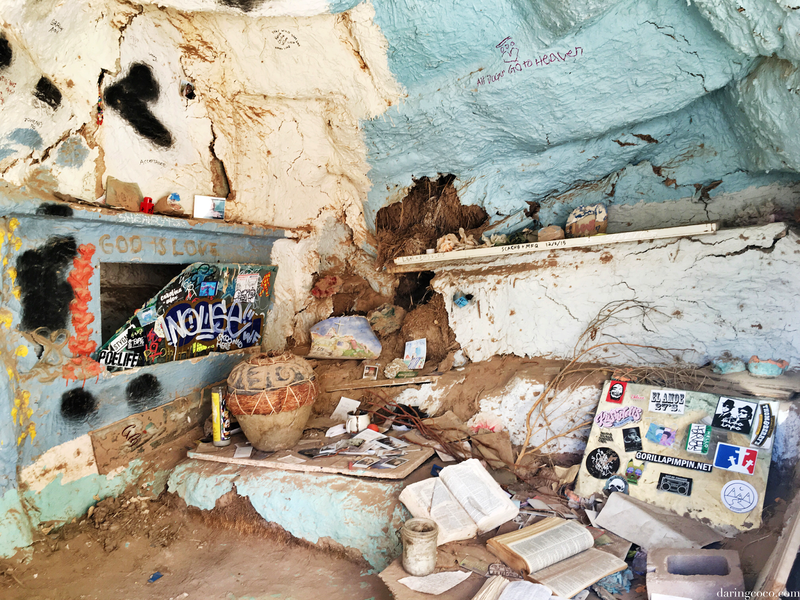 You could spend hours in each space, not just to admire Leonard Knights artwork and devotion but in examining all the small mementos and forget-me-nots that people have left behind. From business cards to photographs, programs and sharpie scribbles. Even old library cards and driver licenses. It was a place for hope and worship; for those who had lost someone or something. Who too wanted to contribute to Leonard’s vision. Unfortunately we’d forgotten to bring along a pen to inscribe our own initials and well wishes. I’d contemplated leaving behind my own business card but decided against it. For me, placing my own felt too impersonal and more like I was promoting myself. Not to say that others who had done the same had those intentions. It’s just the simple white and grey design of my own felt overly stark and detached from such a place of reflection and respect. To the opposite side of these three tombs lies another immense mound holding a vast array of thoroughfares. 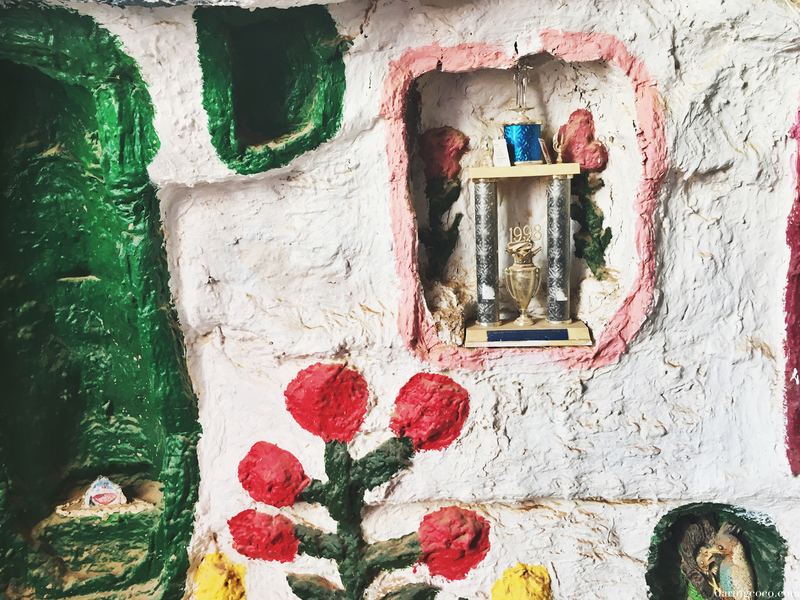 Upon entry you’ll find the story behind the mountain and The Folk Art Society of America’s recognition certificate; both framed and prized. There is no real starting point in here, you simply allow the Universe/God and your limbs to carry you through the tunnels of colour. 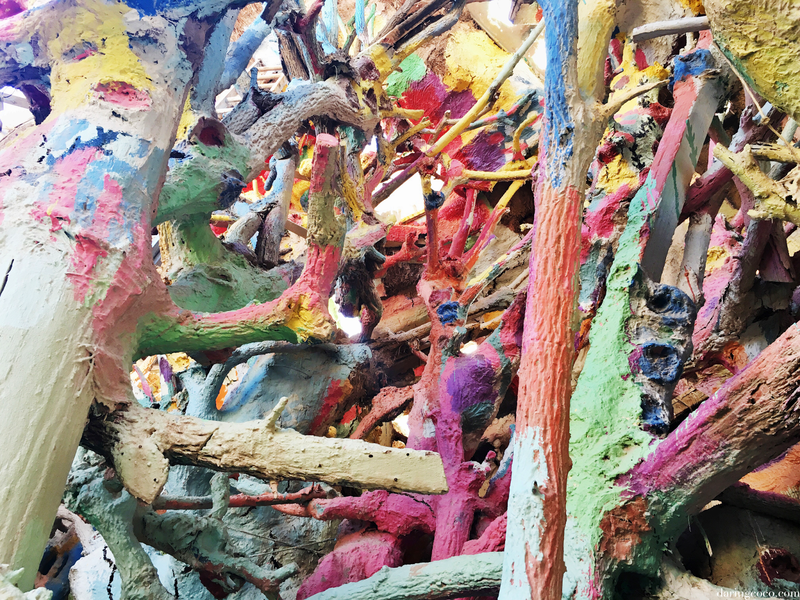 The inner workings of these grottos are rather intricate with many a sight from the ground up and well into the sky where you find a maze of rainbow hued branches, entwined gracefully. There are some parts that feel as though you are wandering through an art gallery; a point of interest encircled by colour. 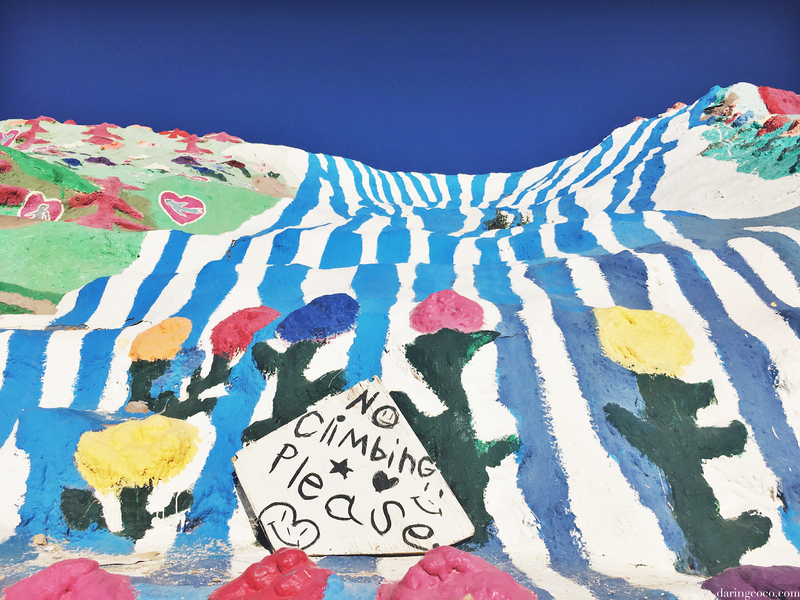 The complexity and elaborateness within the interior of this second mountain is fascinating. 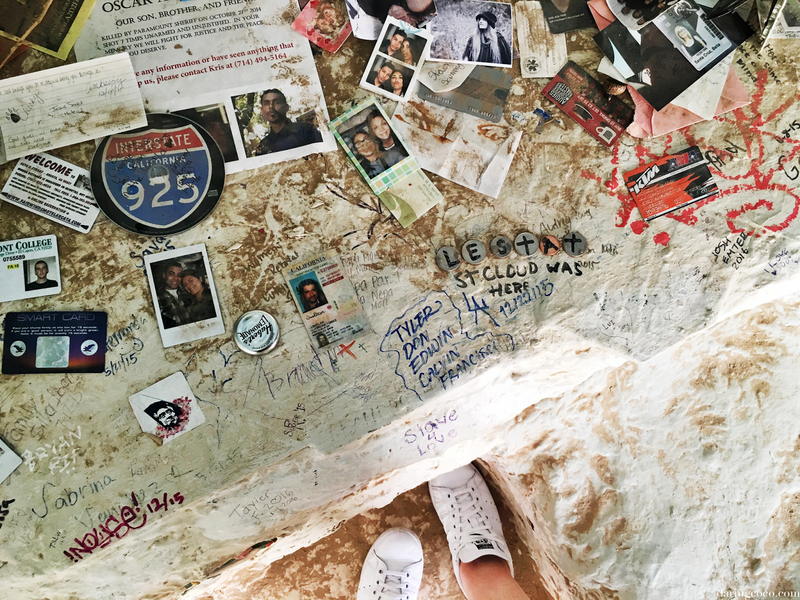 Every inch of space has been thought out and decorated accordingly. Every unconventional structural piece festooned with a flurry of hues. Each piece spotted with vibrant colour, creating a tangled web of artistic awe. 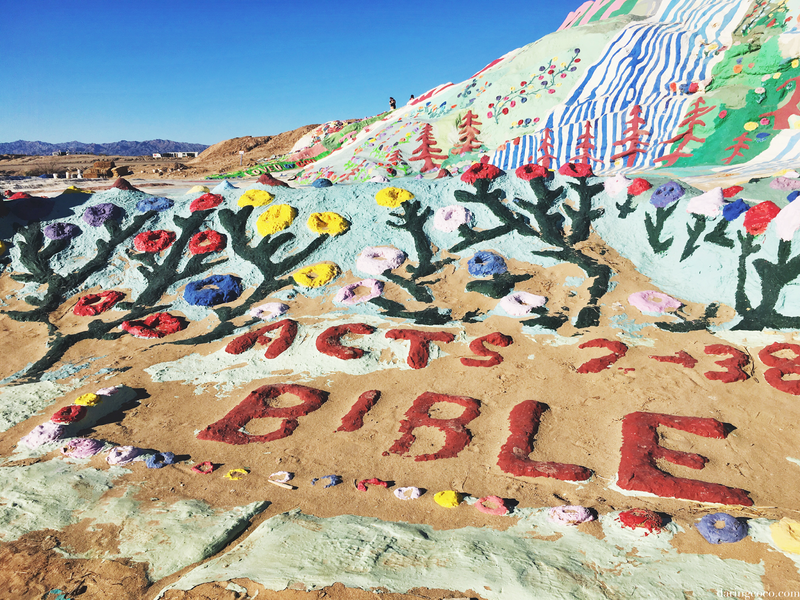 We were fortunate to arrive at Salvation Mountain when we did. Being one of the very first vehicles out of a long line of many. The dirt road seemed to slow many down, mostly those driving sedans as they perilously navigated that uneven dirt road. 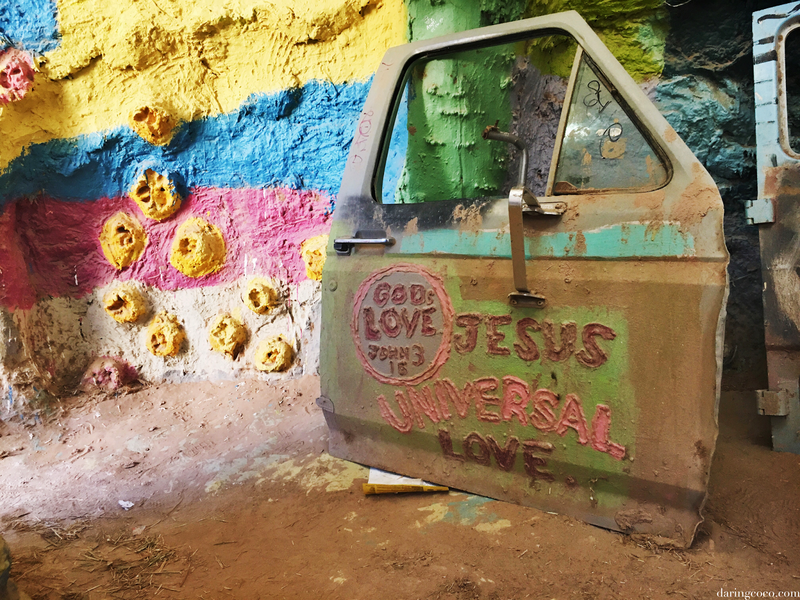 We managed to view the main attraction of Salvation Mountain sans the cluster of tourists that soon followed. 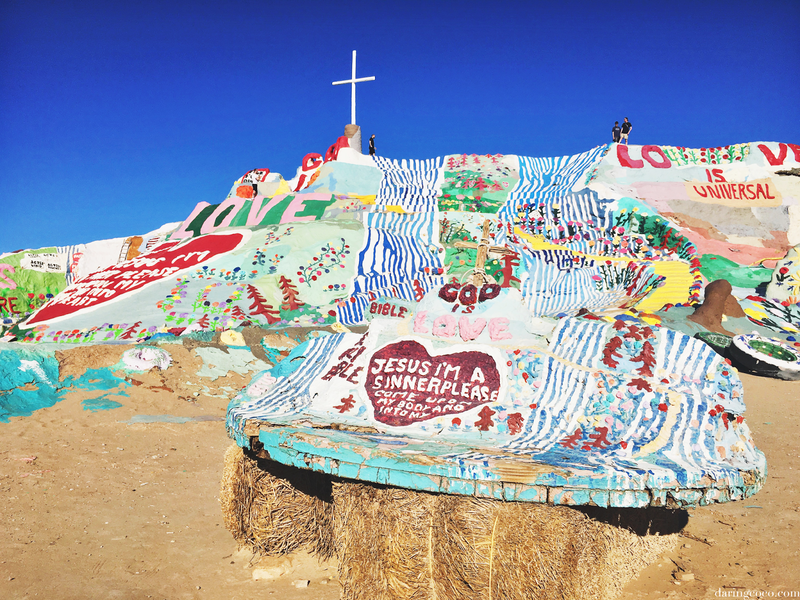 It was rather peaceful, especially when making your way to the top of Salvation Mountain itself. The view from that height gives you another appreciation for the work painted below, as well as a different perspective to admire. From here that expression “feeling on top of the world” does not go astray. More than ever did I feel that personified. 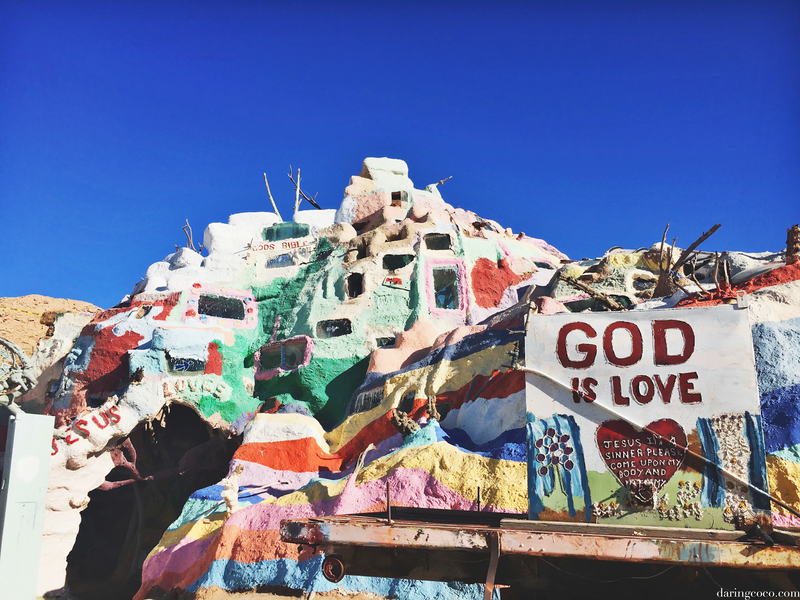 I highly recommend Salvation Mountain to anyone willing to travel off the Californian beaten track. 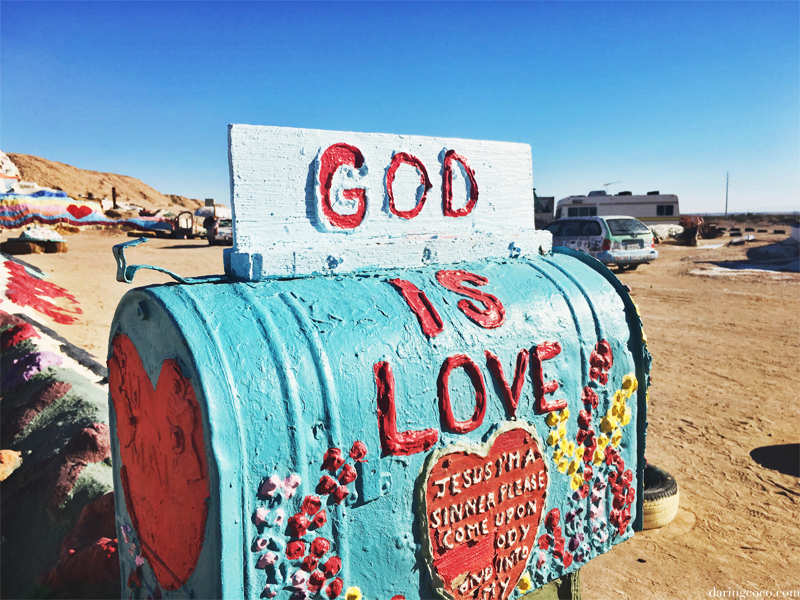 It is ever so inspiring, regardless of religious beliefs or artistic inclinations. 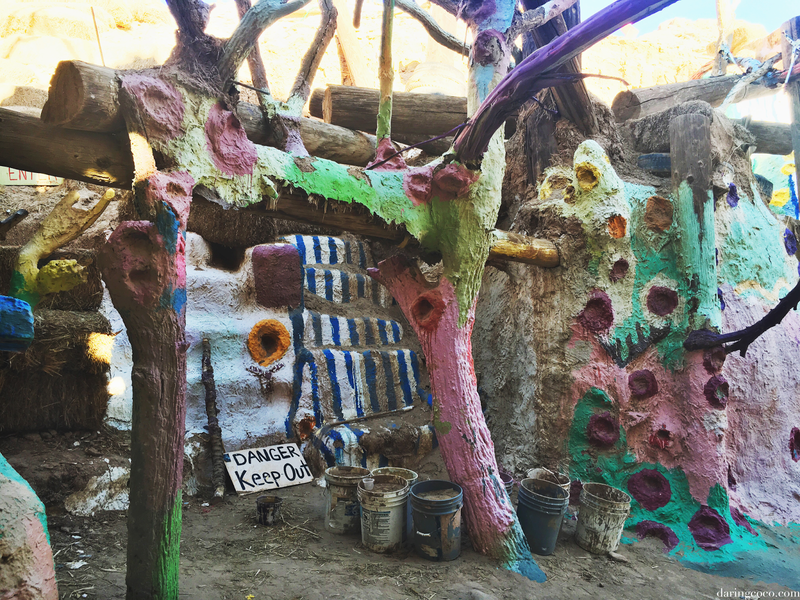 Salvation Mountain is a place for young and old, even mans best friend. Yes, dogs are welcome here (I presume). We noted a handful traipsing alongside their humans. I even managed to squeeze in a cuddle with an adorably pint sized Jack Russell. His human family did not mind. Personally, I think the little guy was overly attentive and sympathetic to my own inner yearnings for my fur baby back home in Australia. 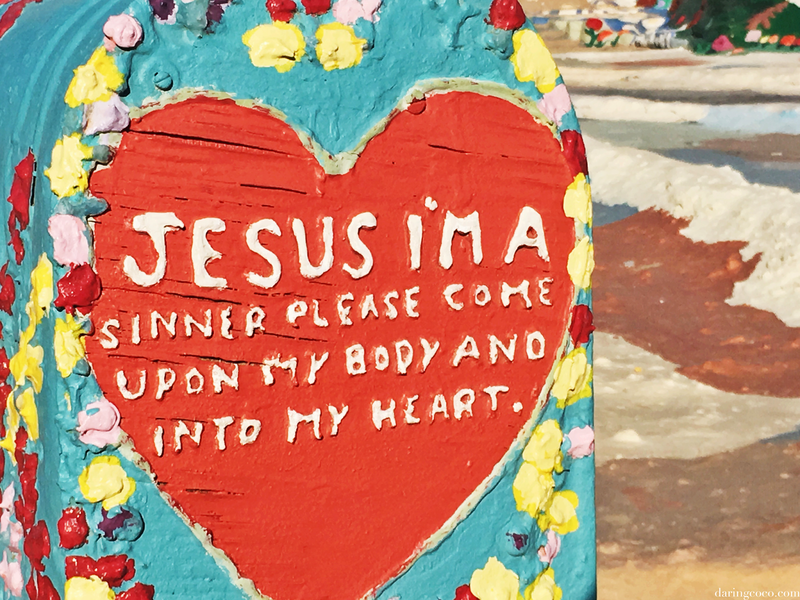 The whole experience of that day at Salvation Mountain is one I am not likely to forget. From the mountain and its messages of hope and love to the actual road itself. One in the end which I found to be rather charming and whimsical. This is the kind of America I’d been dreaming and writing about for many a year now. Desert sands and tumble weeds alongside railway lines and locomotives, all encased within those bouldered giants perched along the horizon. The kind of landscape I had so come to admire and adore.